From cropping and straightening to color correcting, retouching, and painting; from creating selections to combining imagery; from blending layers to adding slick effects, shapes, layer styles, and highly customizable text, Pixelmator for iPad truly does it all…for a mere $5. Released earlier in November, it’s not a port of the popular desktop version of Pixelmator; Pixelmator for iPad was designed specifically for the iPad and iOS 8. As a result, it’s fast and sports a clean and clever interface that doesn’t get in your way. While it doesn’t do everything that Photoshop can do, you’ll be amazed at the kind of artwork you can use it to create. To get started with Pixelmator for iPad, open a photo, a blank canvas (up to 4096-by-4096 pixels in size), or one of 38 photo-based templates, into which you can import your own photos and other artistic elements. To date, Pixelmator’s templates include six different collages, seven frame effects, seven card designs, six posters, and 12 popular photo treatments ranging from super-slick lighting effects to various vintage looks, and none of them are cheesy. Oddly, Pixelmator for iPad refers to starting with a blank canvas or a template as an image instead of a document, so the terminology can get a little confusing when you’re looking for a way to resize your document as opposed to a photo you’ve imported into it. The whole program is layer-based (think stackable transparencies) so you can resize, reposition, retouch, paint or add an effect to something on one layer without affecting the content of other layers. This makes for an extremely forgiving editing environment that gives you truly creative compositing and photo painting or tracing opportunities. Once you pick a starting image (document), you’re treated to a wonderfully Spartan editing interface: tools and commands are nestled inside four menus at upper right, with handy Undo and Images buttons at upper left. Your standard iOS pinch-to-zoom and gestures let you zoom into or out of the image as needed. Tapping the “plus” icon reveals a list of all the things you can add to your image: photos from your iPad’s Photos app, iCloud photo stream, iSight or FaceTime cameras, an empty layer, the contents of your clipboard (something you copied into your iPad’s memory), eight solid color backgrounds, six gradient backgrounds, or six patterns. You can also add text in a variety of fonts, as well as nine different shapes including a rectangle, rounded rectangle, circle, triangle, diamond, polygon, star, heart, and a line. The level to which you can customize these elements is amazing. 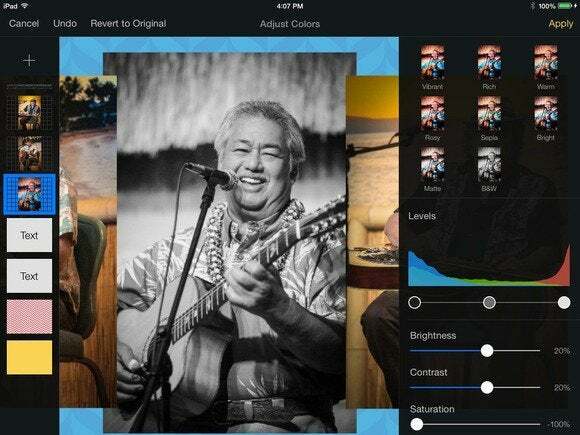 Tap a photo or other element and Pixelmator automatically activates its corresponding layer. You can drag an item to reposition it within your composition—handy guides appear to help you align items with ease—and use the blue circular handles that appear to resize it proportionally (pixel dimensions appear next to your finger as you drag). This entire composition was created in Pixelmator for iPad. As you can see, handy guides appear when you’re dragging an item to help with alignment. Tap and hold any item to reveal a menu with options to cut, copy, delete, or duplicate. 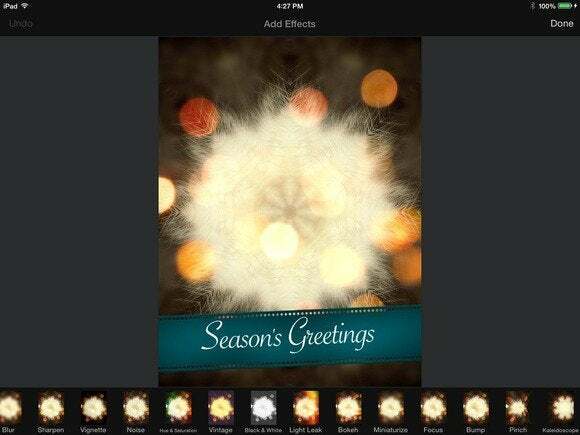 For more customization, tap the left edge of your to screen reveal the layers your image contains. 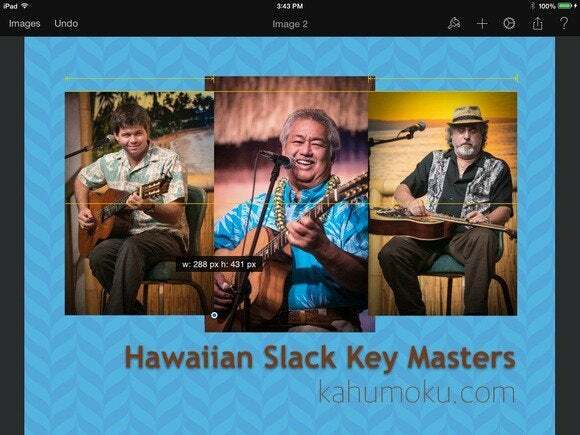 Tap a layer to activate it and then drag your finger up or down to rearrange it in the layer stack. Tap the layer again (or double tap it) to reveal a menu that lets you cut, copy, delete, hide, duplicate, or change its style. Tapping the latter summons a menu with opacity control, a set of 26 blending modes (for changing the way color blends across layers), and customizable fill, stroke, shadow, and reflection options. Tapping the left side of your screen again toggles the layers bar off so you can edit in full-screen glory. Here you can see the layers that comprise this composition, as well as the powerful Style menu. You can tap the Tools menu (hint: it looks like a paintbrush) at upper right for even more options. If text is active, you’ll see a nice array of formatting settings: font, size, color, bold, italic, underline, strikethrough, horizontal and vertical alignment, and line spacing. The same styles are accessible through the layers bar, and an arrange menu lets you scoot items up or down in your layer stack, or lock them so they can’t be moved. If a shape is active, you’ll have access to style and arrange menus, too, though the latter also includes rotation and size controls. 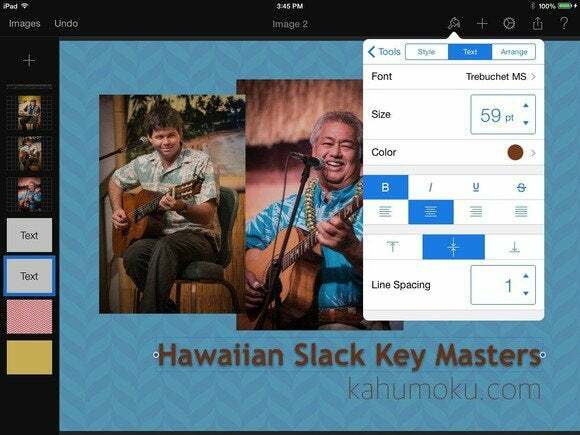 Pixelmator for iPad gives you respectable text formatting options, including access to more than 70 fonts. Tap the Tools menu while a photo is active and you’ll get access to a multitude of paint and erase tools (eight different categories with 12 brush styles each) and nine retouching tools (repair, lighten, darken, smudge, sharpen, soften, fix red-eyes, saturate, and desaturate). Simply tap a tool to activate it and use your finger to apply it to your photo. The tool’s name, and its strength, appears at upper right. You can create a nice partial color effect using the Desaturate tool. If you desaturate too much, switch to the saturate brush to fix that area. As shown here, you can also change tool strength. 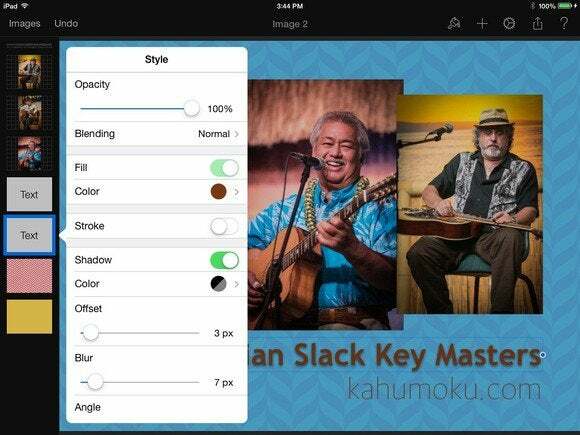 Tap Adjust Colors in the Tools menu to reveal eight creative color presets (vibrant, rich, warm, rosy, sepia, bright, matte, black and white), a live histogram with individual sliders for adjusting shadows, mid-tones, and highlights, along with brightness, contrast, and saturation. Click Apply when finished, or tap the Cancel, Undo, or Revert to Original buttons that appear at upper left. The Adjust Colors command gives you access to color presets as well as a live, adjustable histogram. And by using layers, you can easily apply one effect to a photo without changing others in your composition. Also in the Tools menu is the Add Effects command, summoning 14 effect categories: blur, sharpen, vignette, noise, hue and saturation, vintage, black and white, light leak, bokeh (specular highlights), miniaturize (like a tilt-shift lens), focus (for shallow depth of field effects), bump (for a bulge effect), pinch (for a shrink effect), and kaleidoscope. Each category contains several customization options. Here the kaleidoscope effect was applied to a photo of your author’s black and white cat to create a snowflake. A bokeh effect gives it the illusion of specular highlights. 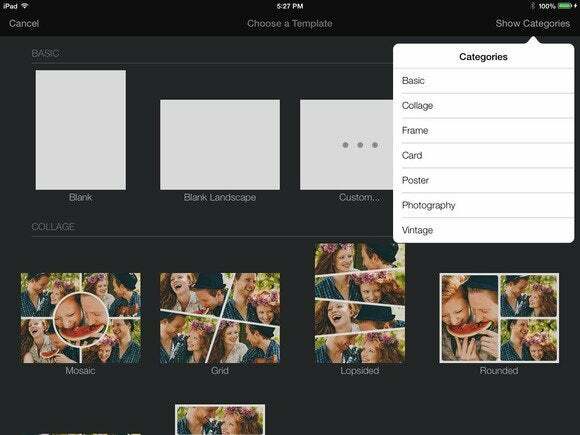 If you want to change part of an image, instead of the whole thing, tap the Tools menu’s Selection command. In Free Selection mode, you can use your fingers to draw a selection or tap the screen to create straight selections. Other selection methods include elliptical and rectangular tools, a Magic Wand for selecting by color, and a Paint Selection that lets you paint atop an area in order to select it. All tools let you add to or subtract from the selection, as well as soften it using the Refine button (think feathering). Handy onscreen instructions help you along during the selection process. Once you’ve created a selection, you can use any of the program’s tools to affect that one area, although there is no masking ability. The Tools menu also includes a Crop tool, with a handy grid and many aspect ratio presets. The Settings button (it looks like a tiny gear) lets you manage your document’s size and rotation, customize guides, enable a pressure-sensitive stylus, or access a comprehensive onscreen help system. The Share button, as you might suspect, lets you send a copy of your image elsewhere, open it in another app, save it to iCloud Drive or your Photo Library. All files can easily be read using Pixelmator 3.3 for the Mac, and they can be saved in JPEG, PNG, or PSD format. 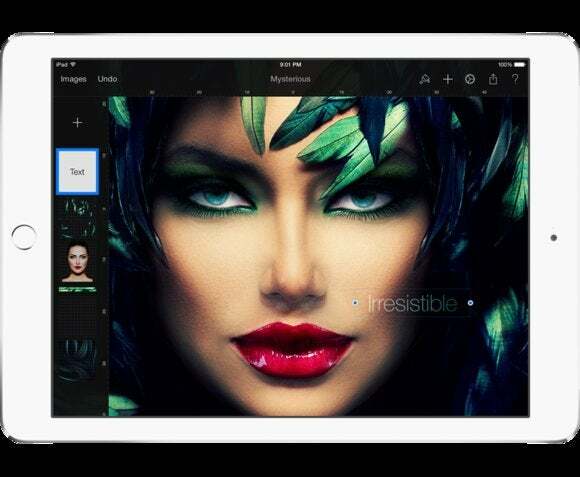 You’d be hard pressed to find a more powerful iPad image-editing app than Pixelmator for iPad, and the only other one that comes close is the far less user-friendly, and more expensive, Adobe Photoshop Touch ($10). While Adobe Photoshop Mix is free, it doesn’t have this kind of editing power. So if you’re still mourning the loss of iPhoto for iOS, or if you’ve got five extra bucks and an iPad, head to the App Store and download Pixelmator for iPad—it makes for a wonderfully creative distraction that you’ll be itching to spend time with. You’d be hard pressed to find a more powerful iPad image-editing app than Pixelmator for iPad.